The Cuisinart Multicooker is a 6-quart multicooker that simplifies cooking by letting home chefs brown ingredients right in the unit before slow cooking. It has preset function buttons and temperature controls that offer brown/Saute, slow cook and steam options making the unit perfect for a wide range of dishes. The MSC-600 is a compact and convenient way for families to prepare everyday meals. It has 24-hour timer that automatically keep warm function that ensure hot meals. The Cook Central Multicooker has many exciting features for users of all types. You can extend the lifetime of your Cook Central Multicooker with the purchase of a FactoryOutletStore Factory Protection Plan. See the Cook Central Multicooker gallery images above for more product views. The Cook Central Multicooker is sold as a Brand New Unopened Item. This was love at first use. I received the multicooker as a gift. I find myself using it at least once a week. I've made soups, stews, sauces, roasts, tamales, and much more. I love only getting one pan dirty. 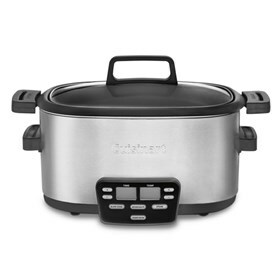 In fact I gave away 2 crock pots because this is so much better than anything else I've used. Best gift I've received in years.